Do it for less, we'll clean up the mess! We supply everything you need to make your dog sparkle and shine! From adjustable tubs, to high-velocity dryers, and specialty shampoos! No more running around the backyard with a hose, or towel drying your wet bathroom, Brookline Grooming is here to save your back AND your wallet! NOW introducing the Evolution Dog Was at Brookline Dog Grooming! BDG is excited to launch the most innovative addition to our shop's history! We have stepped up our DIY Dog Wash game to a whole new level, and you've got to come check this out! The installation of the Evolution Self Wash System at BDG marks the arrival of Boston's next big thing! A true all-in-one bathing system with shampoo, conditioner, and blow dry all in the same place! The Evolution Dog Wash is a self serve cash/card operated dog wash that provides our clients with a sanitary, fun, safe, and affordable way to clean their precious pups. *Rates start as low as $15.00 with $1 increments. No time to Do-It-Yourself? Drop your dog off for a day of pampering while you finish some errands or just relax! Inquire about an appointment and pricing, and we'll do the rest! 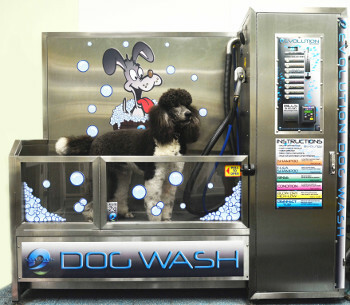 Watch how easy it is to wash your dog in our facilities! Brookline Grooming was featured on America's Best: Best of the Northeast. Hear our customers and employees talk about our products and services, and get a picture of what we do!